Joseph Bottari is an American artist who practices color theory in the form of hard-edge and color-field abstraction. His influence in color and transparency stem from growing up near the pink/grey/black sand of Fire Island New York to the transparent turquoise waters' of Florida's South Bay. Joseph's work reflects close attention to detail, proper orientation, scale, proportion, and balance. Joseph's work stems from his natural ability to draw from a young age where he later enrolled and graduated valedictorian from General Technical Institute of Welding and Drafting in 2004 thus entered the aero-nautical and industrial fields as a Master Welder in fabrication and fitting. 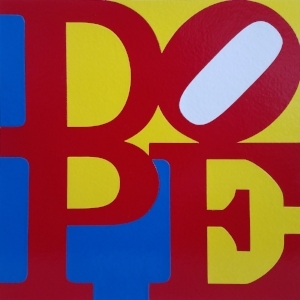 DOPE serves as a juxtaposition, referencing both positive and negative connotations. It's meaning is often misconstrued by the overlapping of two generations due to it's negative stigma. While taking breaks from working on his biggest work to date 'The Experimental Project: Suspension', in 2012, Joseph decided (for fun) to write out the alphabet for in Clarendon font to see what words came to mind and DOPE came to him immediately, amongst a few others, and thought, Not only is DOPE clever, but the timing is perfect because Colorado is pushing for the legalization of Cannabis. Later that year, The Colorado Amendment 64 was passed by voters on November 6, 2012, which led to it's legalization in January 2014.